Team Liquid has released a new update to their 6.35 Pro LCFW, 6.35 Pro-B6 with new features and several bugfixes (specifically with regards to Dissidia Duodecim and it’s DLC). Check this post if want to install Dissidia Duodecim’s DLC on your PSP. A PSP with 6.35 OFW installed. 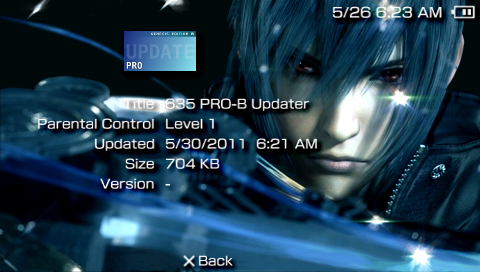 If you’re not on 6.35 OFW and want to install 6.35 Pro-B6, follow this guide: HowTo: Upgrade your PSP to 6.35 OFW. Important Update: PRO-B6 was updated with a tiny patch concerning the NODRM engine. If you have installed 6.35 Pro-B6, please download the installer again and update. file on to your PSP. Copy the FastRecovery and PROUPDATE folders onto ms0:\PSP\GAME (or ef0:\PSP\GAME for the PSP Go). If you encounter problems during installation, try pressing ﻿O+X+Select+Start while turning your PSP on. It will trigger a emergency uninstall and revert back to 6.35 OFW. Homebrew Compatible – Run your own unsigned applications, both user and kernel mode. Plugin Compatible – Add new features to your PSP via kernel mode background plugins. ISO / CSO Game Dump Playback – Backup your own UMD discs via USB and play them from Flash Storage. PSX Emulator Unlock – Play your PSX classics, yes – all of them. Not just PSN titles. what is ms0: ? do you mean x:\PSP\GAME , where x can be any letter? Where are you supposed to place the SDK folder, on the PSP folder or just paste it directly on the memorystick? Would it make any difference if you won’t bother to copy it on your memorystick? You only need the sdk folder if you want to tinker/develop with it. hi. what do you mean tinker/develop with it? what is the use of the sdk folder? do i need to place it in my memory stick? It’s useful to you only if you want to program for the PSP. If not then you don’t need it. Ay kulet. Hinde nga sya kailangan kung maglalaro ka lang. Yes it’s safe. You may want to look at the Dummy’s Guide for more information on HEN, LCFW, etc. hi again…. thanks for your advise…. technically don’t know much about HEN, LCFW, etc. as you said. THanks for this . Eto yung gumana sakin lol .. kso everytime n ptayin ko yung psp balik sa 6.35 OFW , hnd pb nggwa ung permanent pra sa 635? thank you for your advise…. really helped me. how come i can no longer download your Assassin’s Creed? Are they in CSO format? Well if they were in CSO format then it would explain the lag since it has to uncompress it on the fly. Since that’s not the case check if your PSP’s clock speed is set to default (that’ 233Mhz) or higher by pressing select on the XMB menu and checking the value set for Game Clock. Yes, the Prometheus ISO loader will run on 6.35 Pro-B6. Hi, I’ve installed this 6.35 pro-B6 with no problem but when I turned off (not sleep) and turned on again, the pro-B6 is gone and it’s back to 6.35 only. Is there any fix to this or I just hav to keep the pro-B6 updater all the time? WELL U NEED FAST RECOVERY 6.35 WHEN LAUNCH IT GOES BCK TO HOME THEN ULL C IT…. Hi all, i have a problem.. I press X and my psp get’s a black screen and the memorycard indicator keeps flashing.. The only way i get my psp out of that is putting the battery out of it. Now, if i fastly remove the memorycard after installing my psp starts up normally and i can play homebrew and all that kind of stuff, but when i exit the game/app, it’s the same problem..
Black screen and flashing memorycard indicator. Oh, and if i shut down my psp fully my firmware is just 6.35, no cfw.. Either download the installer again or use the newer version, 6.35 Pro-B8. And yes, if you shut down your PSP, it will revert to the official firmware. But when i shutted down my psp and i want the cfw again, i have to install it again or…? Does this happen to all your games? do they have the permanent 6.35 pro-B6? The CIPL flasher is only available on 6.20 PRO-B builds.